Transparency Market Research (TMR) has published a new report titled, “Polymerase Chain Reaction (PCR) Market: Global Industry Analysis, Size, Share, Growth, Trends, and Forecast, 2018–2026.” According to the report, the global PCR market is projected to reach over US$ 7.0 Bn by 2026 expanding at a considerable CAGR from 2018 to 2026. North America is expected to dominate the global PCR market during the forecast period, due to high adoption of technologically advanced molecular diagnostic products, growing incidence of infectious diseases, rising prevalence of various types of cancer, growing trend of self-diagnosis of diseases, and affordability of high-cost testing processes for people in the region. The report offers detailed segmentation of the global PCR market based on product and end-user. In terms of product, the market has been segmented into instruments, reagents, and consumables. The reagents segment held the leading market share in the year 2017 and is expected to expand at the highest CAGR during the forecast period. This is attributable to high consumption of reagents for the PCR technique. Introduction of advanced reagents specific to the type of test is expected to boost the global demand for PCR reagents in the near future. PCR reagents include template DNA, PCR primers and probes, dNTPs, PCR buffers, enzymes, and master mixes. PCR consumables mostly include PCR tubes, plates, and other accessories required to conduct PCR reactions. The instruments segment has been sub-categorized into standard PCR systems, RT PCR systems, and digital PCR systems. Among these, the digital PCR systems sub-segment is expected to witness growth at a significantly rapid pace during the forecast period. This is attributable to advantages of digital PCR systems such as precision, sensitivity, accuracy, reproducibility, direct quantification and multiplexing, and speed of the analysis. The PCR technique has been found to be useful in pharmaceutical and biotechnology research activities as well as microbial quality testing. The technique is also applied in genetic engineering. Genetic engineering is the key driver for the global PCR market. It is used to identify genes related to certain phenotypes including genetic disorders. Regular testing of the microbial load of raw materials and finished products is an important process in the pharmaceutical & biotechnology industry. Sophisticated analytical methods such as polymerase chain reaction (PCR) have been widely applied for quality control analysis in the pharmaceutical sector. Molecular diagnosis has revolutionized the modern diagnosis technology. PCR has become a method of choice in early and accurate detection of diseases. 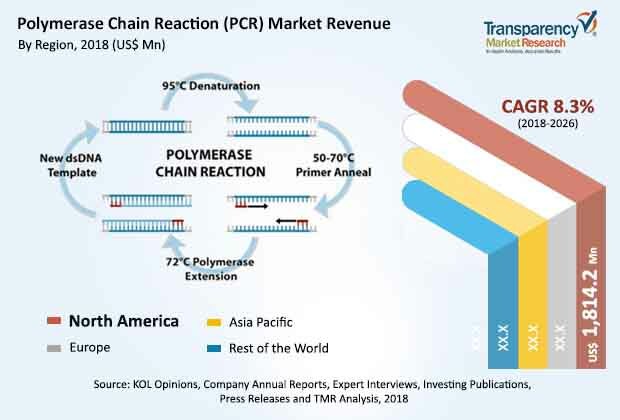 Expansion by leading manufacturers of PCR products in the Asia Pacific region by strengthening of the distribution network and new product launches in developing countries of Asia Pacific are key factors likely to drive the PCR market in the region during the forecast period. Moreover, rise in the incidence of cancer and infectious diseases has resulted in increase in the demand for use of the PCR technique in clinical diagnosis of these diseases in Asia Pacific. For instance, according to the Korea Central Cancer Registry published in 2016, there were 217,057 cancer cases in South Korea in 2014. Moreover, in 2016, the WHO estimated that the Asia Pacific region has the second-highest number (i.e. 5.1 million) of people living with HIV across the world. Thus, Asia Pacific is expected to be the most lucrative market for PCR by 2026. Major players operating in the global PCR market are Bio-Rad Laboratories, Inc., QIAGEN N.V., F. Hoffmann-La Roche AG, Thermo Fisher Scientific, Inc. Becton, Dickinson and Company, Abbott, Siemens Healthcare GmbH (Siemens AG), bioMérieux SA, Danaher Corporation, and Agilent Technologies. Key players are expanding their product portfolio through mergers and acquisitions and partnerships and collaborations with leading pharmaceutical and biotechnology companies and by offering technologically advanced products.